Are you passionate about the hospitality industry? Our team is growing & we want YOU! 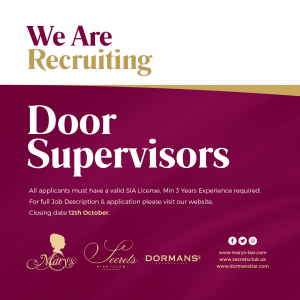 If you have a positive attitude, are great with people, are a team player, believe in exceptional customer service and have a passion for entertainment and drink, then we would love to hear from you! Please read all corresponding literature below regarding the application process. Due to the high volume of applications we will be unable to respond directly to enquiries regarding the process. All necessary documentation below. Thank you for expressing your interest in the security role(s) within the McGlone Group. This is an exciting opportunity to join the core security team within Mid Ulster’s leading hospitality venue(s). Please find the application pack links below and ensure that they are completed in accordance to the guidance outlined within the ‘Candidate Information link. Please Read before beginning the application process. Bar Staff must be 18+ Years Old due to Licensing Law & Regulation. By clicking the bullet points above the corresponding file will download & open for each job role. If applying for multiple job roles please ensure the correct application form has been completed.